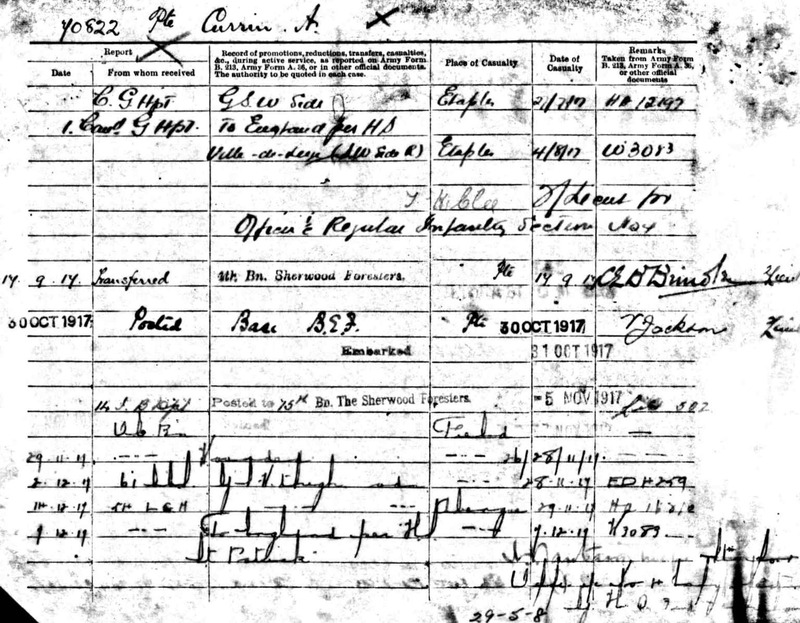 Alfred William Currin, a 37 year old cloth presser from Burton Latimer near Kettering, attested on the 4th December 1915 (possibly under the Derby Scheme) and was posted to the Army Reserve. 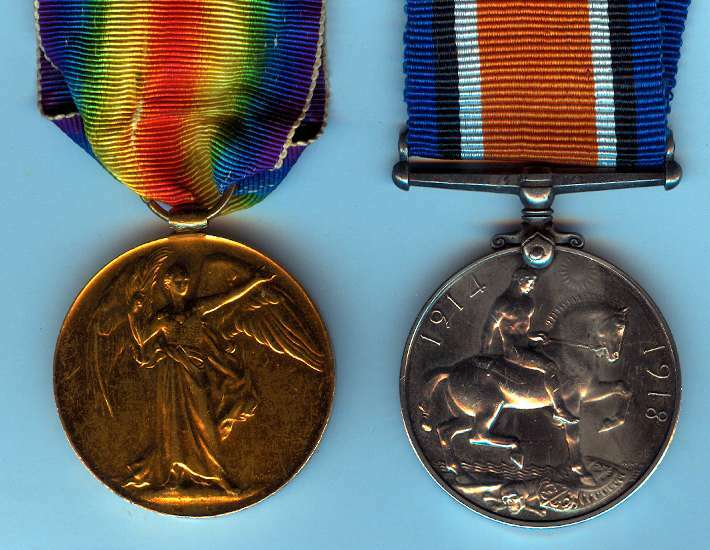 He was mobilised on the 21st March 1916 at the Depot of the Northamptonshire Regiment and posted to the 8th Reserve (3/8th) Battalion two days later. Alfred was transferred to the 1/8th Battalion on the 16th July 1916 and arrived in France with the 15th Reinforcement on the same day. Alfred initially joined the 4th Entrenching Battalion before joining the 1/8th Battalion ‘in he field’ on the 30th July 1916. Eight days later he suffered a gun shot wound in the right arm during a bombing attack and was treated at the 3rd North Midland Field Ambulance and 20th Casualty Clearing Station before being transferred to the 7th Canadian General Hospital. After convalescing in the 3rd Convalescent Depot he was transferred to the 14th Infantry Base Depot and the posted to the 9th Battalion Sherwood Foresters under Army Order 204 and Army Council Instruction 1499 of 1916 on the 29th (see below). 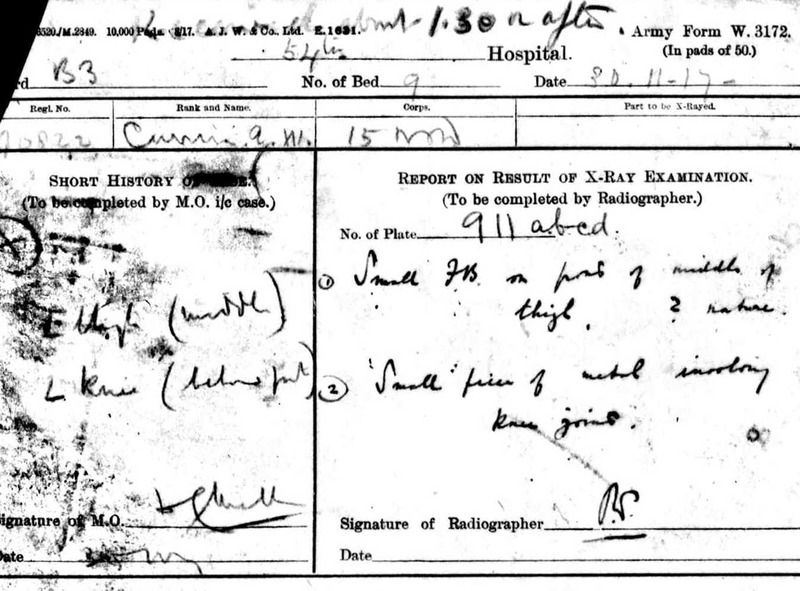 On the 25th July 1917 Alfred was wounded in action a second time during the 3rd battle of Ypres. Alfred suffered a gun shot wound in the side and barbed wire cuts, possibly as a result of his involvement in a trench raid by “A” Company under Captain J Critchlow. In total 1 Officer and 10 other ranks were wounded during the raid. For further information please refer to the 9th Service Battalion the Sherwood Foresters: The Nott's and Derby Regiment During the First World War (page 16) by Steven Morse. 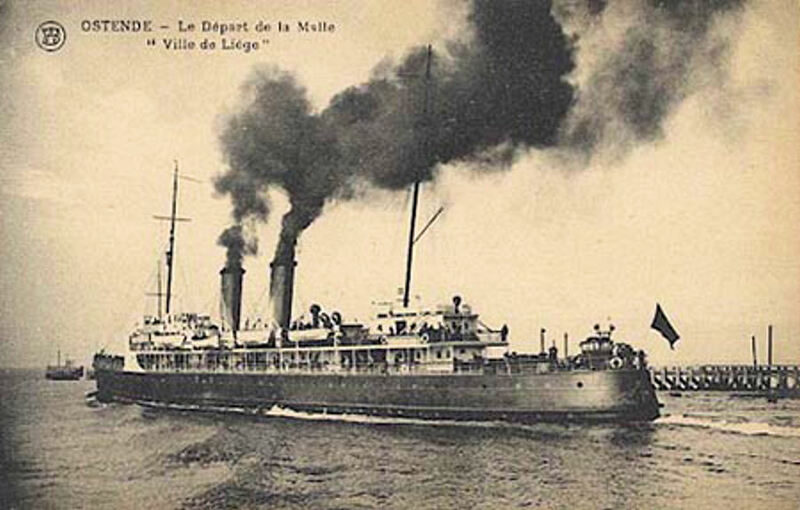 Alfred returned to England on the Hospital Ship Ville de Leige. On returning to England Alfred was treated in the 1st Southern General Hospital in Edgbaston for a shrapnel wound in the chest and an abscess over the knee that had been caused by a barbed wire cut. 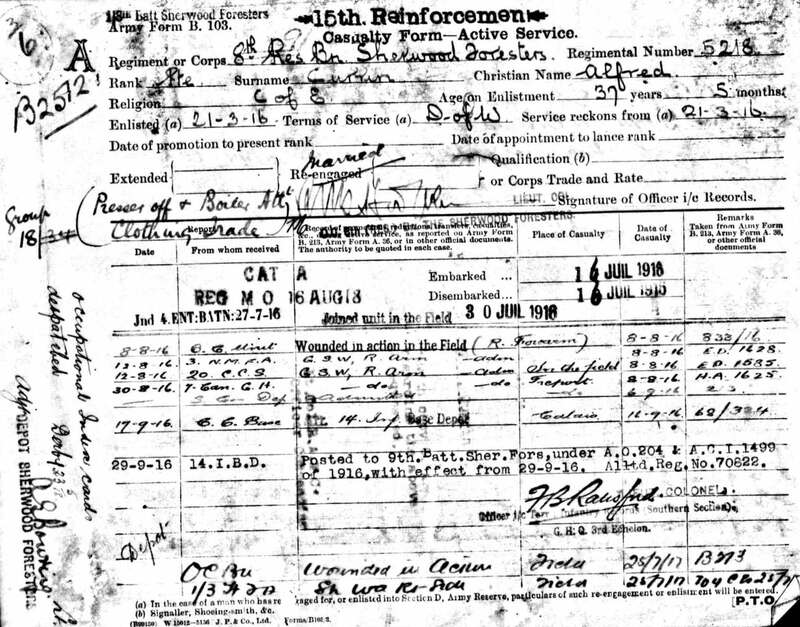 Alfred returned to France on the 30th October 1917 and was posted to the 15th Battalion on the 5th November. He was wounded in action 3 weeks later by a shell wound in his left thigh and knee. At the time of his wounding the 15th Battalion were holding trenches near Poelcapelle during the final stages of the the Battle of Passchendaele. In total the 15th Battalion suffered 12 other ranks wounded during two days ‘in the line’. 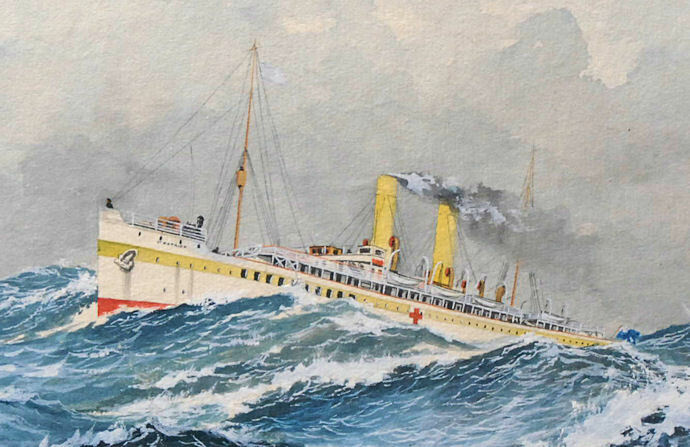 After returning to England on HMHS St Patrick Alfred was treated in the Manor (County of London) War Hospital on Horton Land near Epsom. An x-ray taken at the time records that he had a “small” piece of metal in the knee joint. Alfred was posted to the 3rd Battalion at Sunderland before embarking from Folkestone for Italy in August 1918. Alfred was initially posted to the 11th Battalion Sherwood Foresters for record purposes and then Compulsorily Permanently transferred to the 2nd Battalion Royal Warwishire Regiment at the G.H.Q Reinforcement Camp in Italy. 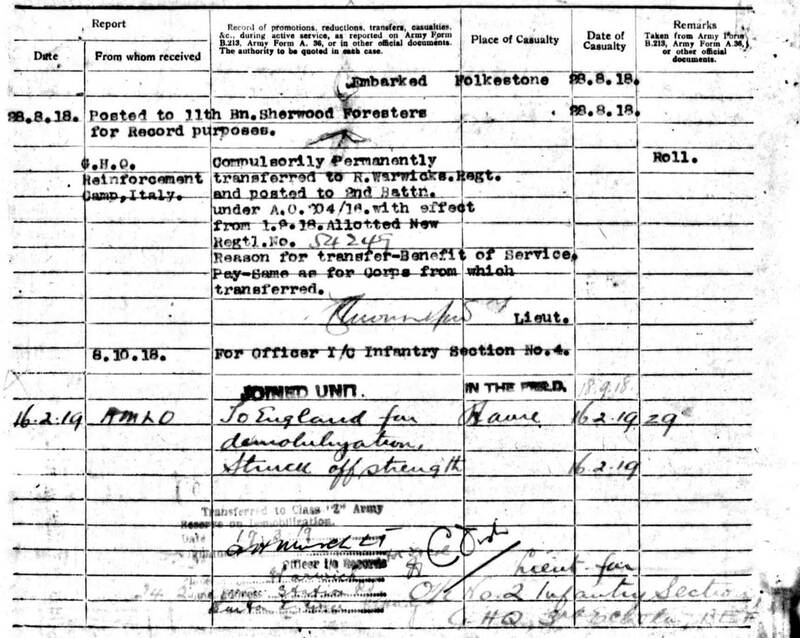 Alfred finally returned to England for demobilisation and was struck off strength on the 16th February 1919. Alfred died in 1946 aged 67.